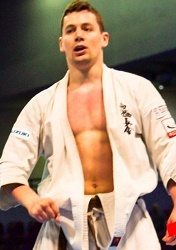 Mazur continues to prove his level, and he establishes himself in Europe.Taking third place in the EC 2012/13. In 2015 +90 2nd place in the EC, and 8th in the World Championship, facing Yuji Shimamoto! During this time demonstrated his toughness and ability to withstand punishment, and extremely strong in his condition. 2nd in EC 2016, and Winner of EC 2017 and 2018. Besides that, 49th All Japan Open 5th place 2017, and a strong 5th place in 1st WFKO International Tournament and secure the 2nd place i the EC Open Weight 2018.